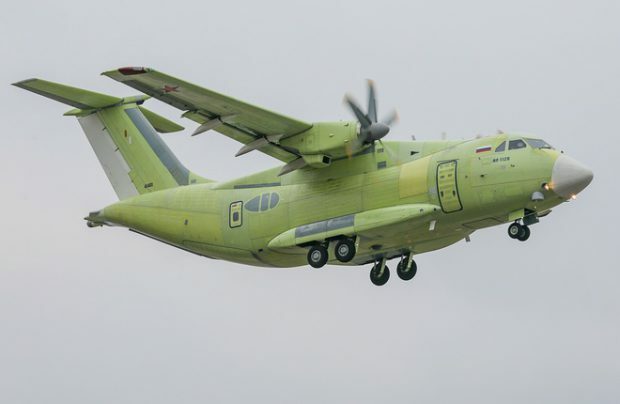 The IL-112V prototype of the new Russian lightweight turboprop military transport aircraft has made its first flight from the airfield of the Voronezh Aircraft Manufacturing Company (VASO), which is part of the UAC transport aviation division. On March 30, the transporter flew for about 40 minutes, performing a flight that took place ‘in normal mode’, UAC reports. Apart from the fact that the IL-112V is intended to replace the country’s fleet of ageing Antonov An-26 military transport aircraft in the Russian Air Force, the project is also important and indicative for at least two additional reasons. Firstly, this is the Russian aviation industry’s first foray into the creation of its own significant turboprop aircraft. Historically, the creation of such light turboprop transport aircraft in the former Soviet Union was the responsibility of Antonov, a Ukrainian company. That is why UAC is now emphasising that the construction of the IL-112V requires only Russian-made parts and assemblies. Secondly, successful work on the IL-112V is key to the creation of a modernised IL-114-300 passenger turboprop, since the latter is using the civil modification of the TV7-117CT turboprop engines developed by the ODK-Klimov enterprise. The the TV7-117CT-01 will become the standard powerplant of the new passenger aircraft that will replace the An-24 in the fleets of a number of commercial airlines. Besided a number of Russian commercial carriers have already expressed interest in the civilian version of the IL-112, the ramp aircraft. Denis Manturov, Russia’s minister of industry and trade, says that estimates indicate the need for some 100 IL-112s. Undoubtedly, the project’s creation process has been spread over an inordinately long time, with the initial development of the IL-112 launched in the early 1990s, nearly 30 years ago. Then, in the spring of 2004, more than a decade after the plans were instigated, the project won a tender from the Russian military department. At the time, it was expected that the IL-112V would make its first flight in 2006 but, for various reasons, the project was put on ice and resumed only in 2013.